We may not always recognize our guardian angel! Love this- especially the way you added the words into the composition. Beautiful! What a beautiful piece for this week's challenge. I agree sometimes I forget about my guardian angel but I know she has helped me many times. I am learning so much from everyone's posts and yours is so beautiful. I love the painted angel and all the collage dimensions. Very nice. Our guardian angels are almost always incognito. I'm don't know what mine looks like. Yours is very pretty. That is So True! Your guardian angel looks very whimsical. Gorgeous, gorgeous, gorgeous! I really love your interpretation and creation for this week's challenge Maggie ~ beautiful!! Wow...love this!! how beautiful..gorgeous angel...very enchanting..and the whole piece is symbolic and magical! I was hoping to play too! Loved this theme! Your work is stunning and awesome! She's perfect - from her pretty pink hair to the tips of her feathery wings! I never think to add words to my work but I should - I love when other people do it, it gives a whole extra dimension. How very true! Wonderful mixed media piece!!! This is gorgeous. I love your take on this theme because you made it so personal. Glad you got it finished on time. I would have hated to miss this lovely angel hiding behind her mask. 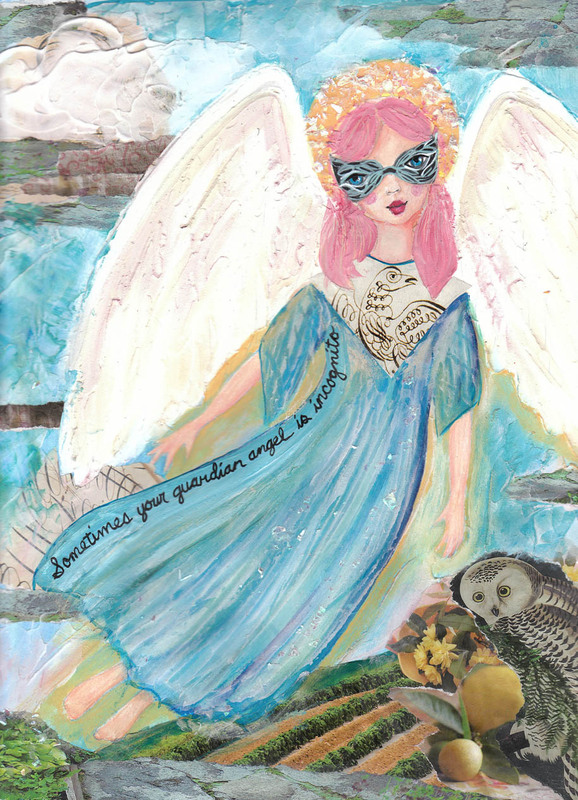 I love your guardian angel!I love that you put a pretty mask on her~ So true, but we need to listen to her whispers when we hear them! I think sometimes we don't recogonize our Angels because sometimes they can be pesky buggers...push,push,pushing until we do as they say instead of doing what we want to do. But the sense of accomplishment is reward enough...I always thank those little guardians...without them I would surely be a lump of unproductiveness.